Philadelphia – – After the Philadelphia Flyers moved out of the Spectrum a new building became their home in 1996. Since then its had many names but that’s not important. What is important is the fact that the first sporting event to open the building was the 1996 World Cup of Hockey. A lot has been written about how the Team USA beat Team Canada 2-1 in the best of three series. Most folks may not realize that seats were still being installed in the building prior to that game in Philadelphia. 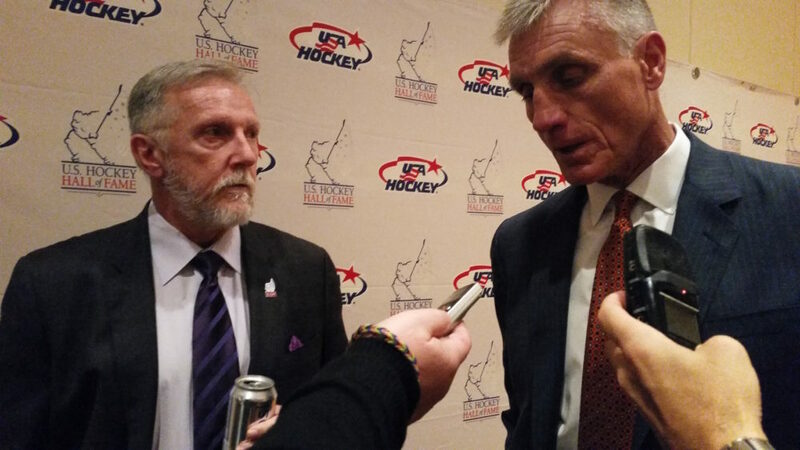 Paul Holmgren, who was the associate coach of the team remembered it well. Coach Ron Wilson, also known as “Hammer” Holmgren remembered that as well. “I was really impressed with the building. To play in a building that was so big. It was massive. And like Homer said it was incredibly loud. It was even louder when we played against Canada in the first game of the Final. But we couldn’t ask for anything better from our fans. Did the team get a call from then, President Clinton or a high-ranking official at the time? In addition to the induction of the Class of 2016; the 1996 World Cup team, Bill Belisle, and Craig Janney. Pat Kelly and Mark Howe both received the National Hockey League’s Lester Patrick Trophy.